Please join us Wednesday Nights, 6pm MTN for this super successful webinar series! Feb. 20 Showcase your Act. Book and Promote gigs. Know what it will take for you to get booked as a Featured comedian and Headliner. 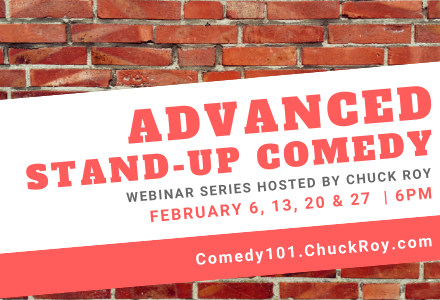 Develop a funny comedy routine that can get you booked as an opening act. Sell tickets to your comedy shows. Develop the performance skills that help you ‘crush’. Here’s What You Get When You Purchase The Webinar! Exclusive access to a 4 private webinars. A professionally designed online course that helps you prepare for the video conference. Examples of a booking kit and Electronic Press Kit (EPK). Tips and advice for performing as the Featured Comedian, support act or opener. Guidelines for marketing yourself for gigs and selling tickets to comedy shows.